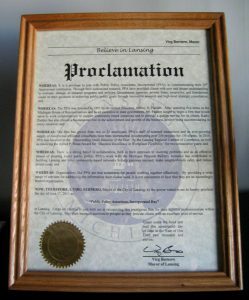 LANSING – Mayor Virg Bernero declared Friday, June 17 as Public Policy Associates Day in Lansing, helping celebrate the national research firm’s 20th anniversary of helping shape better public policy. The company invited past and present clients, employees, and friends of the company to a celebration at the PPA office on Marquette Street on Friday. PPA is a Michigan small business success story, growing from a two-person shop to a nationally recognized firm with 26 employees providing independent, high-value research and strategic consulting services to state, federal and local government, foundations, and nonprofits. At the celebration, City of Lansing Finance Director Jerry Ambrose presented PPA President Jeffrey D. Padden with a plaque commemorating the anniversary and said the mayor had declared the day Public Policy Associates Day in Lansing. Some of the clients have included the U.S. Departments of Labor and Education, numerous agencies within state government in Michigan and other states, and foundations such as the W.K. Kellogg Foundation and C.S. Mott Foundation. The company specializes in education and workforce development, criminal and juvenile justice, human services, and economic revitalization. PPA’s research and consulting services have been used to enhance public safety by helping parolees succeed, support community-based collaborative strategies to reduce homelessness, advance Promise Zone scholarships, evaluate workforce development initiatives, assess policies to improve outcomes for students of color, and expand opportunities for women in the emerging green economy. “We owe our success to our diverse and talented researchers and staff, who are committed to delivering the best possible results for our clients,” said PPA President Jeffrey D. Padden. Mr. Padden founded the company in 1991 after serving in the Michigan House of Representatives for 10 years and as an executive in state government. The company has earned a national reputation as a place where bright and dedicated staff enjoy a collaborative workplace and have the opportunity to flourish. PPA has been honored with the Alfred P. Sloan Award for Business Excellence in Workplace Flexibility for the past two years. PPA was also named the Lansing Regional Chamber of Commerce’s 2009 Small Business of the Year. PPA has had a working relationship with the Small Business Association of Michigan almost from the beginning, and most recently helped develop the association’s vision and strategy for economic gardening, a new economic development strategy that has since been embraced by Governor Rick Snyder. PPA is fully committed to diversity; both in its workplace and in helping clients and others achieve their goals. PPA and the Lansing Regional Chamber of Commerce are cosponsoring the 2011 Employer Conference on Workforce Diversity on August 25.